Yesterday was the spring equinox and the greenhouse is now full of spring flowering orchids including this magnificent Cymbidium species. I think this will have to be Cymbidium week on 365 days as we have lots of species in flower and it is nice to showcase some of our iconic Himalayan species. 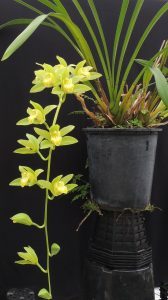 Cymbidium lowianum is native to Burma, Thailand, Vietnam and China where it grows as an epiphyte in cool montane forest. 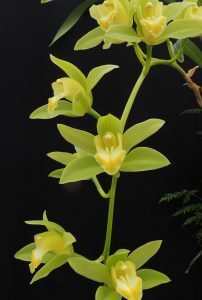 Cymbidium lowianum grows into a very large plant and has lovely large pseudobulbs, long thick leaves and very long arching flower spikes that naturally grow out to the side of the plant. We are keen to show off the natural grace of these flower spikes and so do not stake them – though that does have issues for space. 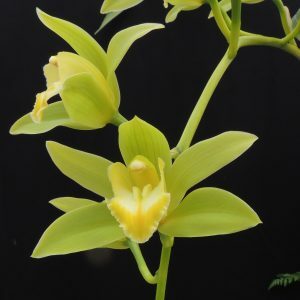 Any large growing orchid species has had to evolve a way of presenting flowers for pollinators clear of the leaves and Cymbidium lowianum has achieved this by growing its spikes out down into what will always be a space if you grow up a tree. 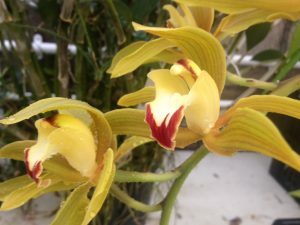 The variety here is concolor which like alba varieties in many orchids has no red pigment in the flowers. The more usual form (below) shows how the red pigment dominates on the lip but also gives stripes on the sepals and petals. Both varieties are lovely but the clear greens and yellow flowers on lowianum concolor are especially arresting.